In most chemical processes it is essential to obtain a clean, pure product. Most chemical processes involve the separation of chemicals in a complex liquid mixture. Separation, in the case of chromatography, is achieved by flowing the liquid through a solid material. Whilst the liquid is going through the material different products will flow at different rates. It is the difference in these rates which provides the separation. The controlling factor in the separation is the composition of this solid media. The BDC has two chromatography systems where different solid media can be utilised. 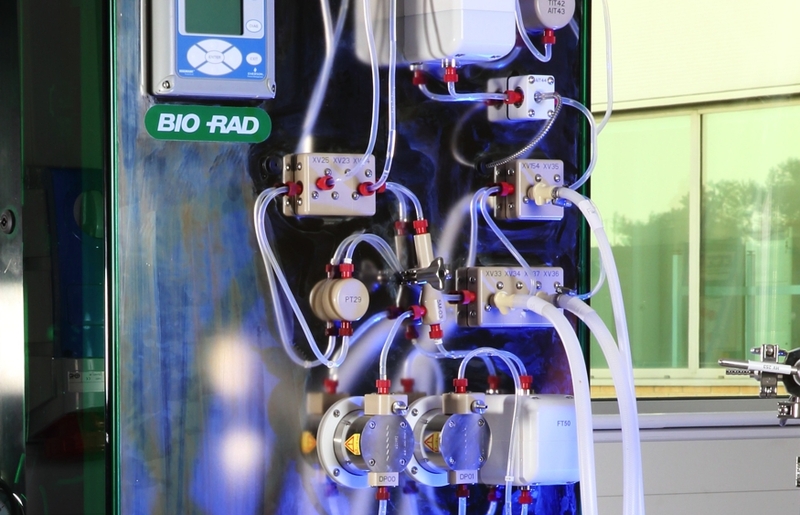 The Bio-Rad chromatography station is designed for the small-scale production/purification of pharmaceuticals or proteins. It has a column diameter of 100 mm and flow rates of between 5-120 L/hr. The Biotage Isolera LS system is a flash purification system designed for the separation of complex organic mixtures. It has cartridges instead of a column which are typically pre-packed. The flow rate of the Isolera system is 5-400 mL/min. To learn more about how our chromatography systems can be put to use please contact our separation expert Raymond.